I have been so busy I forgot to share the news! The latest Aimee Ray’s book Patchwork Embroidery was released in November. I contributed 3 projects to the book. The projects were designed by me, Aimee provided the art work and I made the items. All the projects have a patchwork component as well as embroidery. Have a look at my projects. Which one do you like best? This one is my favourite and the easiest to make of the 3. The book is beautiful, as all Aimee’s books are. I totally recommend it – disclaimer: I’m not making any money out of this book because I made the projects on commission. I seem to have a soft spot for Christmas tree craft. I have done 5 types of Christmas trees using different techniques in the past three or four years. One of my favourites is the Patchwork tree softie. This tree softie is made with the smallest of scraps and is super easy to make. You can even make a little forest in different sizes! The easiest and quickest by far is possibly the Christmas tree softie. I recommend you use the Patchwork tree softie pattern instead of the one provided as the patchwork tree sits a lot better. There’s a third tree softie I made last year using embroidery as the main technique. It is the Embroidered Christmas tree softie. I like the effect of using long and short stitch in a gradient. Finally, if you prefer a no sew project I have made two trees this way using head pins and polystyrene cones. The Snowed top Christmas tree was my first of this kind. Unfortunately I don’t have a pattern for this tree as it belongs in a book I contributed this project for. And finally there is the No sew Christmas tree ornament that I made as I got into fabric manipulation (see my 41 fabric manipulations I have used in the making of 2 textured quilts). It uses fabric scraps, ribbon and sequins pinned to a polystyrene cone. I hope you enjoy making these. And if you do please share a photo in my Flickr group. Fabric, ribbon and heaps of headpins is all you need to make these 4 Christmas decorations. All of them are easy enough to make with young kids. All four Christmas ornaments are made using a polystyrene shape, fabric or ribbon and head pins. This treel is made with polystyrene cone, head pins, fabric, ribbon and sequins. This Christmas ball is made with with a ball covered by wide ribbon in matching colours attached to the ball using head pins. Use wide ribbon to make this wreath though it can be made as well with fabric folded as per instructions. For a more country look use checks fabric. These are called quilted Christmas ornaments and you can make them in different ways. My post shows you the simplest way to make a quilted Christmas ball. 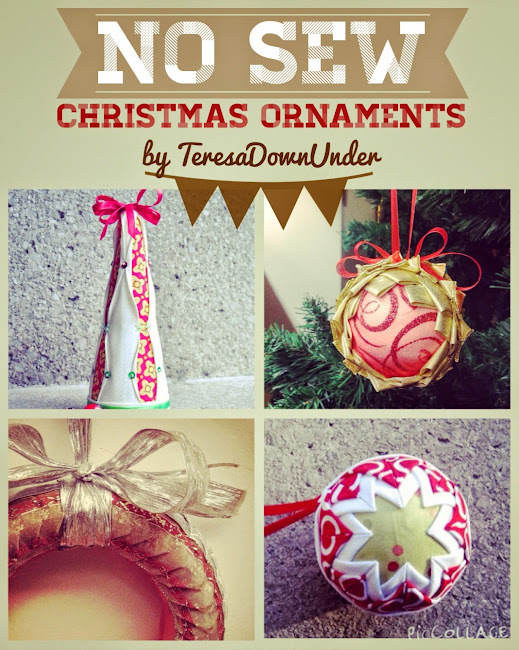 Enjoy making these ornaments and show your pictures at TeresaDownUnder flickr group. 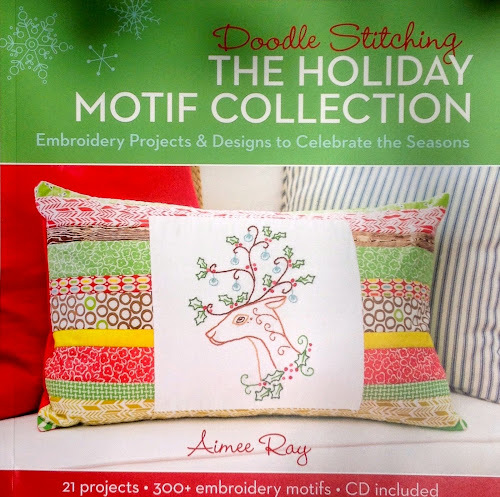 Doodle Stitching: the holiday motif collection is out! And I’m in it! 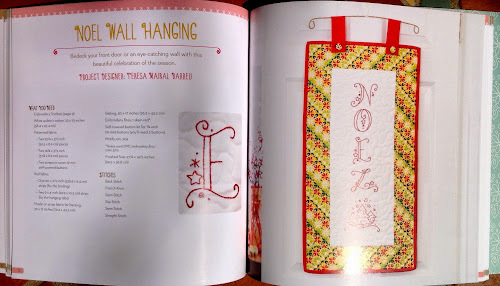 Doodle Stitching: the holiday motif collection was out last month and now that I’ve seen the book I can say it’s a truly beautiful book with heaps of embroidery motifs to use and 21 full projects, including my own! This is the second book I contribute to and it is particularly special because this is a book by Aimee Ray, my favourite embroidery designer. So if you like embroidering, or even if you’re a beginner, head out to Amazon, look inside the book and read the great reviews the book has received so far. If I had to choose one word to define this book it would be adorable. You can see more of this book on Lark crafts website. “Never Been Stitched: 45 No-Sew & Low-Sew Projects” is out! This is quite exciting for me. 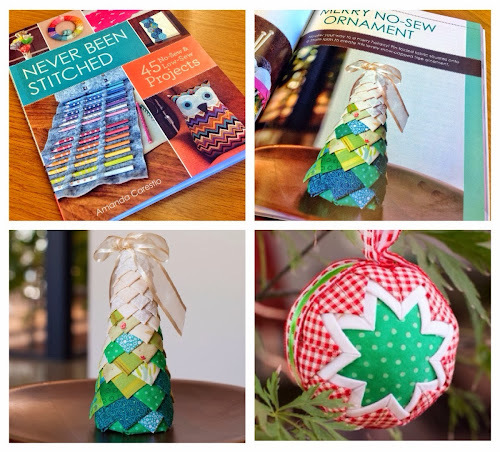 Yesterday I received a complimentary copy of Never Been Stitched, a crafts book with 45 no- and low-sew projects to which I contributed the Merry no-sew ornament and the suggestion of a quilted Christmas ball, both made only with folded fabric pinned to a polystyrene shape (see pictures of the projects above). Imaginative, inventive, and filled with beautiful things to make, Never Been Stitched is the ultimate collection of no- and low-sew projects. Thanks to fusible webbing, fabric glue, grommets, and other fun materials and techniques, crafters barely need a needle. Forty-five fast and simple items range from a folded market bag to a cute kid’s apron to a plush pillow. A short basics section plus templates help even beginners create quick and stylish garments, home décor, and other accessories. If you’re interested in purchasing the book a quick search will take you to Amazon and Barnes and Noble. The publisher, Lark Crafts, is also giving away free downloads from Never Been Stitched.